Wow – some positives from the meeting with the Lib Dem Minister of State (Department for Transport) Baroness Susan Kramer – see article about that by clicking HERE. I have received a letter from Robert Goodwill, who is the Tory “Minister” for cycling (aka Parliamentary Under-Secretary of State for Transport). 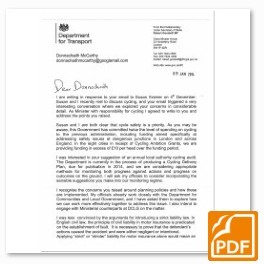 Whilst the letter covers only a few of the cycling safety issues I raised with Susan, it does cover my request for ministerial clarification on the guidance for implementation of the fixed penalty fines for pavement cycling. This follows my being told by Operation Safeway police that they had been instructed by their senior officers to ignore the guidance and to implement the letter of the law instead. This was one of the issues the Vauxhall Cross Demo was addressing. He also gives a potential positive to our suggestion that the DfT should be monitoring what local councils are doing on cycling, so that the data can be examined and compared and badly performing councils identified and held to account. I have attached the letter (click on the thumbnail to see the pdf copy). 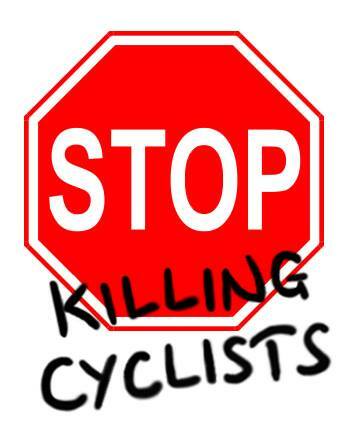 Previous PostPress Release – Minister Endorses Responsible Pavement Cycling by Vulnerable Cyclists if Roads are Too DangerousNext PostWe now have a YouTube channel! well they should have written it so that only those riding recklessly on footpaths were breaking that law… not leaving it to discretion. Congrats on your latest results ! PLease think about following the Initiative of R o W NYC and create a clock Also . THOSE that click ” LIKE ” on RightofWayAustralia come from MANY Countries , so there is a NEED for this type of ACTION ! Can’t believe the Comment has not registered ! Please ask yOUR Facebook Followers to ADD ” LIKE ” so as to increase value of the effort , whilst aimed principally at Oz , will no doubt contribute to YOUR Efforts ? See also SkippyAus.blogspot.com where some ” SubAds ” are already included ! Most of MY ” LIKES ” appear to come from all over the world so i should think you could create a ” Vision ZERO Clock ” also ?